A simple drawing of a little girl drawn by my little girl. Ava wishes everyone a Happy New Year! Currently on hiatus with the family. I plan on writing some sort of meager year-end wrap-up soon, so I'll try and concoct something witty for you all to revel in. So here we have a wonderfully cheerful Christmas scene, complete with Santa, a Christmas tree and kids. 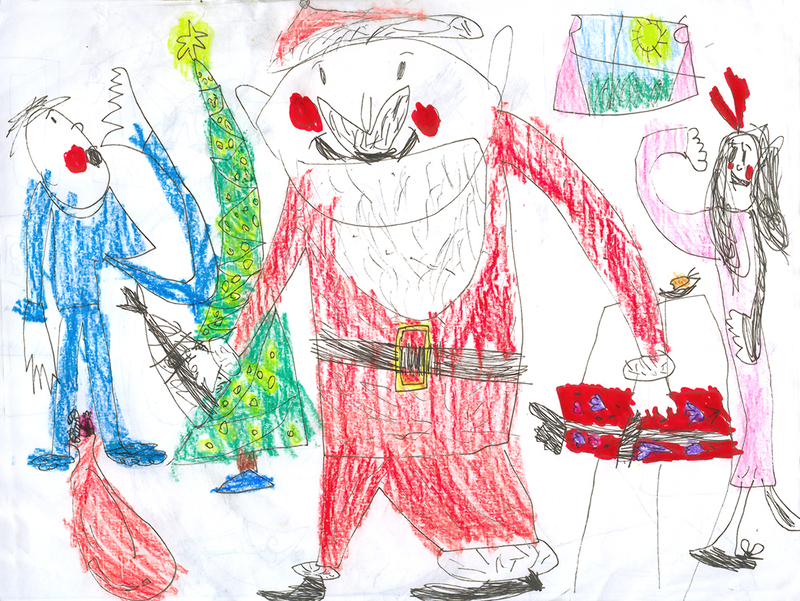 I like that Ava has drawn the Big Red Guy in full stride, in motion, with gifts in his hands. There really isn't that much of a story here, but Ava did say that the boy on the left is surprised to not find any gifts for him. I'm assuming that Santa is trying to get there in time to give the boy his presents, but since I'm not the artist, I won't know for sure. The girl to the right is not Ava -- I'm wanting to assume that Ava draws herself in almost all her drawings, but apparently that's not always the case. A nice touch is the half-eaten carrot for the reindeer on the table there. Ava tells me that this is a girl who was surprised by something and that she's dropping a doll. You can see the motion lines right where the doll is. I like how she tried something different here by drawing a large profile, with a very detailed eye. 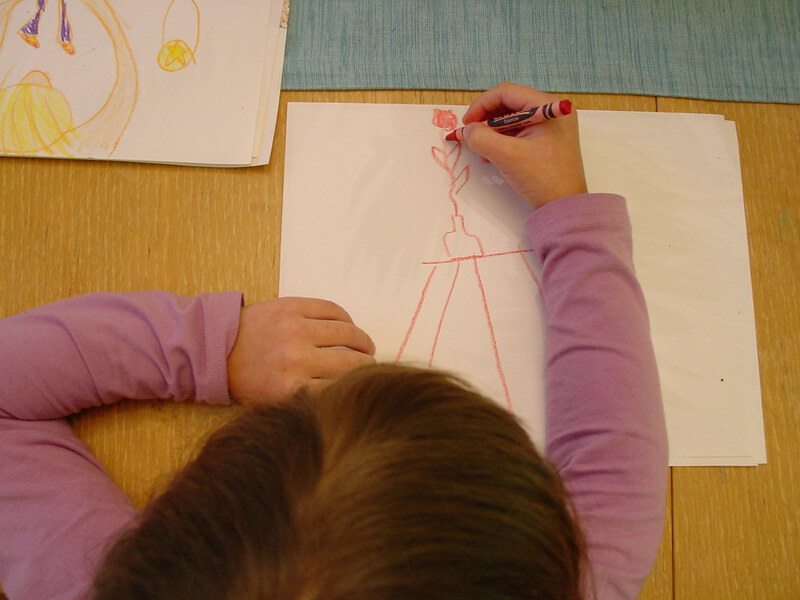 It looks to me that Ava was really working on more detail in this picture than usual. That's a toybox over on the left, and "Toe" is Ava's way of writing out "Toys" phoenetically. With her learning to read and write, we were told that it's good for Ava to try and write out what she thinks the word is by mouthing it out and to listen to how it sounds, but not to correct her too much. As usual, to view these images closer, click on them and you will be taken to their Flickr page. From there, click on "All sizes." Well, if I don't see you guys before then, I want to take the time to wish you all a very Merry Christmas and a very Happy New Year! 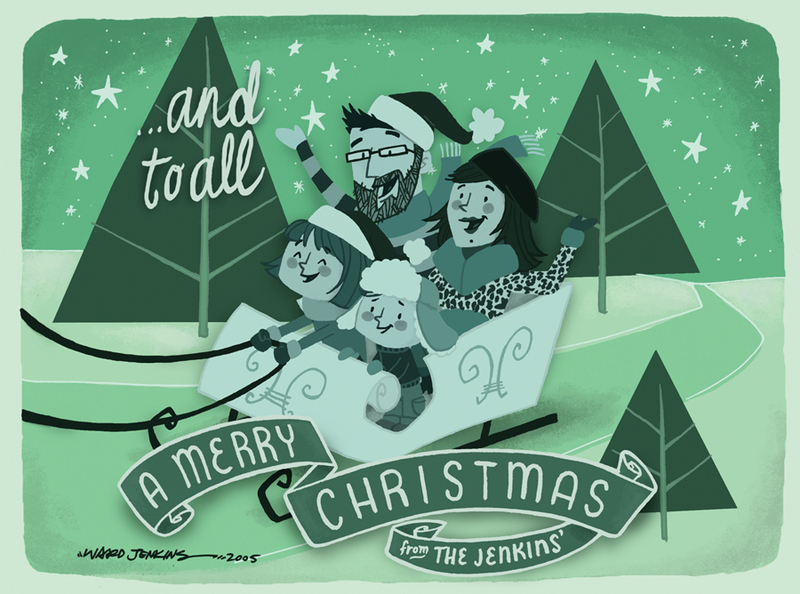 From the Jenkins Family to yours, best wishes for the Holidays. 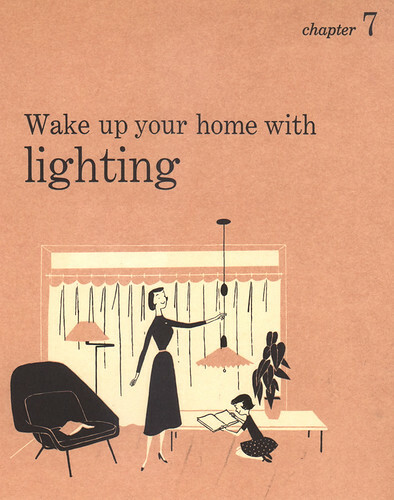 Check these illustrations out from the Better Homes & Gardens Decorating Book, 1956 edition. I got it off of eBay when a saw a co-worker's copy on her desk at work. She had an edition with a nicely illustrated cloth-bound cover, but the version I have has a simple turquoise cover. No biggie, as all I really wanted were the great series of illustrations found on all the chapter dividers. 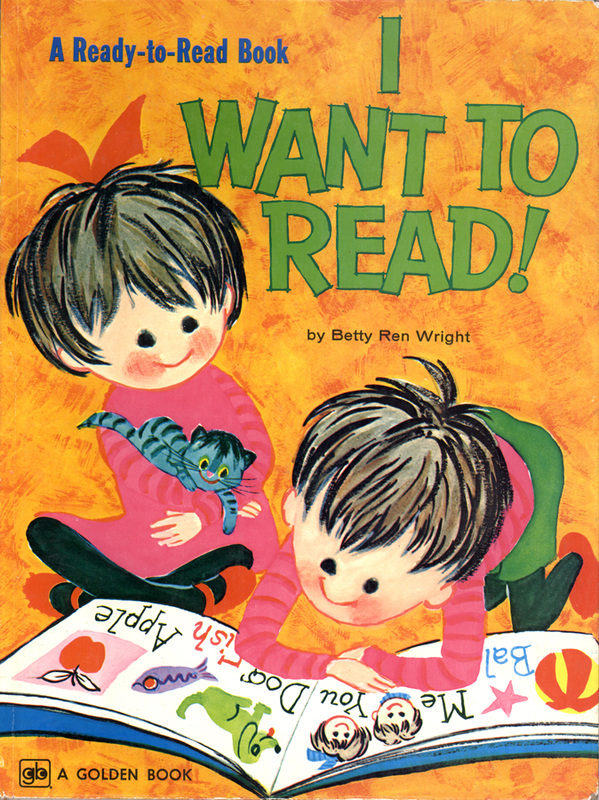 Wonderful yet simple stylized characters done in a two-color process, very typical of spot illustrations at that time. The sad thing is, however is that there is absolutely no credit given to the artist. I searched throughout the entire book but couldn't find anything. It's a shame, really. One thing I find interesting, the photos of rooms throughout the book gives us a great insight into what was happening in home decorating at that time. 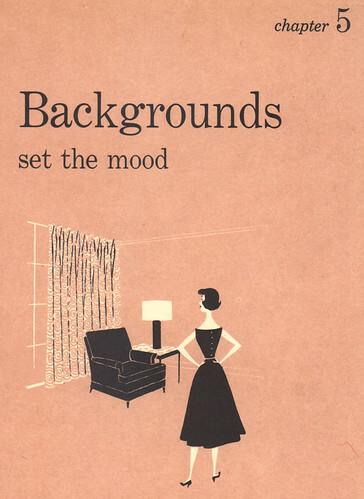 Of course, all the rooms shown were more of an idealized version of the plain-jane reality that was probably true to the typical modern home of 1956, but it is still fascinating to see what trends were strong, what colors were in vogue, what furniture styles were big while thumbing through this book. 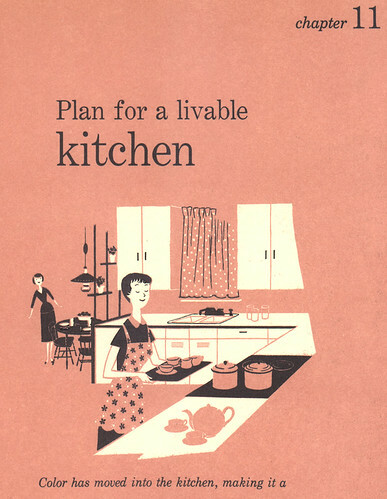 But it's all about the illustrations for me. 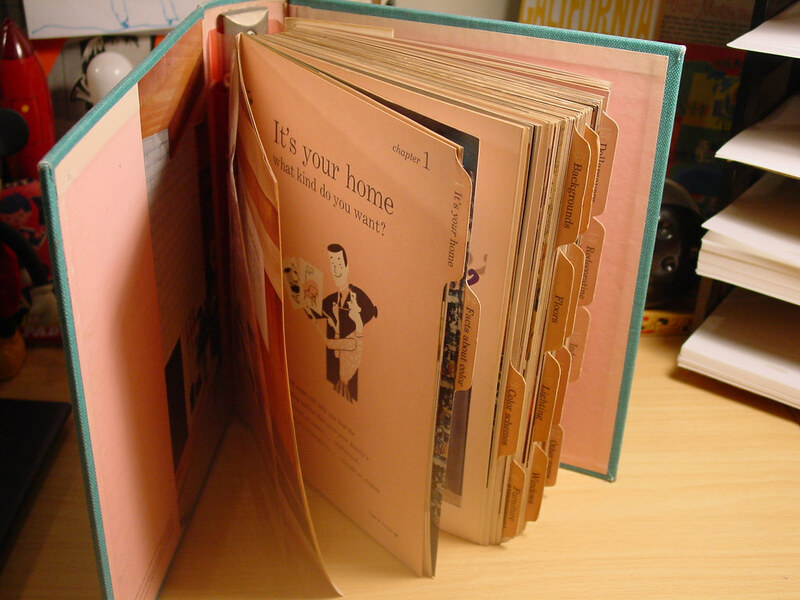 The book is actually a five-ring bound notebook sectioned off into chapters, with sturdy paper dividers tabbed for easy access. It is on these dividers where these fun illustrations reside. The characters are simple, but effective in telling the story for each chapter topic, whether it be for choosing color schemes, glamorizing your floors, or lighting up your rooms with the right lamp. I would have to say that the images are deceptively simple because the more I look at them, I begin to see just how sophisticated the artist was in executing each scenario. 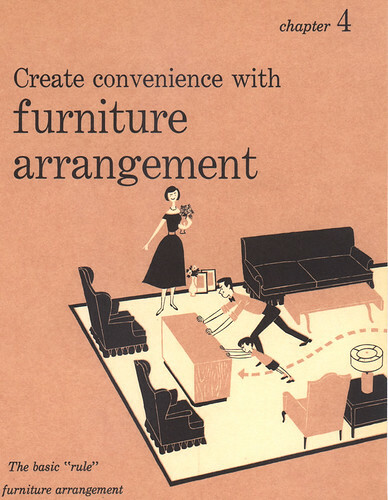 The layout, the placement of the furniture, the poses of all the characters are done with finesse. I'm posting just a few of the illustrations here, but I have the entire set scanned and put together in a Flickr photoset. You can check them all out HERE. Notice here that the two choices of chairs the wife is holding up represent the two major decorating styles of choice that were at issue at the time: Conventional and Modern. (In this book, they describe the two styles as Colonial and Contemporary, but I've seen several variations on these themes, and they all pretty much mean the same thing.) 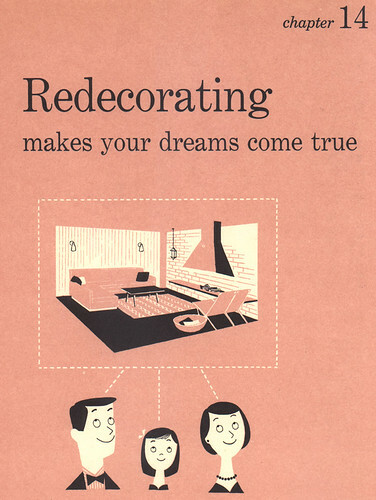 A slight generalization here, I'm sure, because there were many, many other decorating styles that popped up around that time. But from what I've seen and read in many home decorating magazines and the like (including this particular book), a good many articles focused on talking, discussing and debating about these two opposing decorating patterns: which one was best for your home, the pros and cons of each, how to mix and match to make every family member happy, etc. It's a very fascinating thing to read and look back on. The above two pages showcase the artist's great sense of positive and negative space, giving off the impression that there's more to the illos than the limited use of two spot colors, white and black. 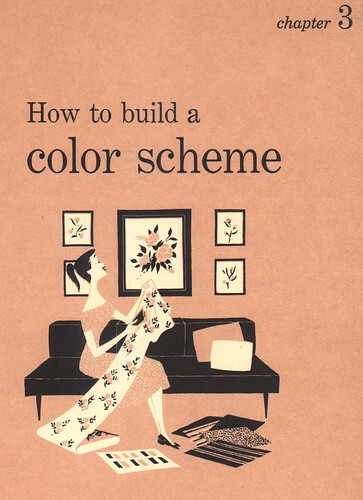 By incorporating the background color of pink, a third color can be implemented. Looks easy, but it is very difficult to pull this off, believe me. There's this uncontrollable urge to draw everything out in black line and then fill in with white, because that comes natural to any artist. It's what we've been doing since we could pick up a crayon. There's more thinking that goes into illustrations like these, and in order to make it look so easy without any hitches -- well, that's the sign of a great artist. Oh, and I have to say that the standing pose the woman hits in Chapter 10 is brilliant. There's a great sense of weight and proportion to her that is just perfect. The artist did a great job in conveying her standing with weight shifted over to the side, contrapostal, I believe. The artist was a great draftsman, too. Look at the layout and overall design of this room. Thre's some nice stuff going on in here. I especially love how the woman is definitely in charge here. Looks like she's really getting into it! Yes, she's in the kitchen, but now with style. Again, to see the rest of the images from this set, check them out HERE. 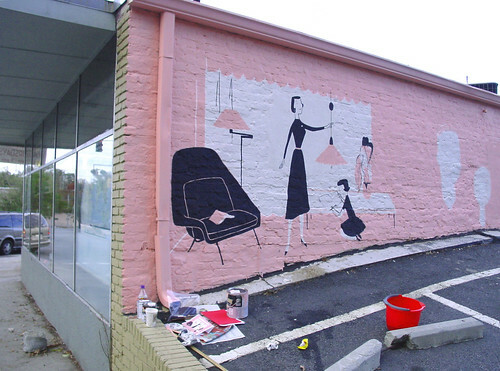 Like I've mentioned before, I'm currently painting a mural for Victory Vintage Home, in Decatur. 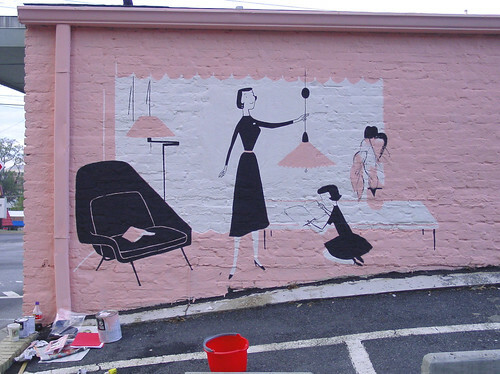 I approached the owner, Lee, about perhaps enlivening up the back wall behind her store because she had this area that was simply perfect for a mural -- not too big, not too small. Plus, it's right next to a main road, with many cars passing by, most of which will be stopped because of the traffic light right there where the store is. Perfect opportunity for adding on to what the store is all about. Instead of doing something original, I thought it would be a great idea to incorporate, or rather, reuse illustrations from the Decorating Book and duplicate them for the wall. 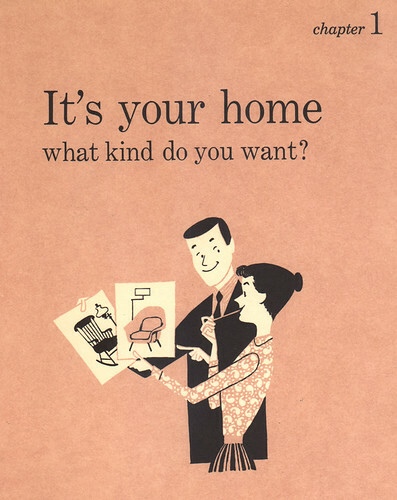 Since Victory Vintage sells furniture and items from the 40's to the 70's, and most of what Lee sells is modern by design, these illustrations were perfect! When I showed her my proposal with the images photoshopped over photos of her back wall, Lee just about flipped. It's been an interesting thing to duplicate large up on a wall what was originally meant to be viewed in a smaller scale like a book. The images so far transpire really well. Bold lines and color help. It's taking me a while to work on it -- finding time outside of work and family business is very rare and fleeting -- so BIG props to Lee for being so patient with me in all this. I'm having a blast with it so far -- that is, when I do manage to eek out the time to paint. If anyone in the area would like to check it out, stop by the store at 303 E. College Avenue, just across from Agnes Scott College. This scene will be virtually unchanged. I love the floating heads of the family here, so they will be in the middle of the mural. Plus, I'll be painting "Redecorating: making your dreams come true" right above them. This part will be at the far right of the wall, with the woman moved a bit to utilize the space better. I added a nose to the mother there -- for some reason it looked better. I've finished the girl since this photo was taken. Another shot of the wall. You can see where I've painted the white for the family's heads in the distance there. Try to stop by and check out the progress when you can! Offer me some hot coffee to warm my freezing bones -- it gets pretty cold and lonely in the back there. And now for something completely different! 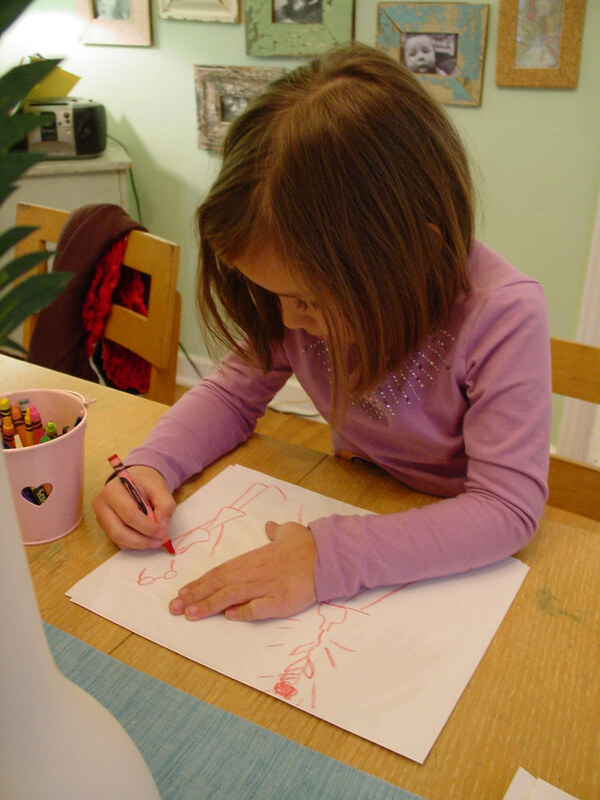 In an attempt to prove to you all that I do not ghost-draw for my 5 1/2 year-old daughter, Ava, I was able to capture her in the act of drawing her next masterpiece. 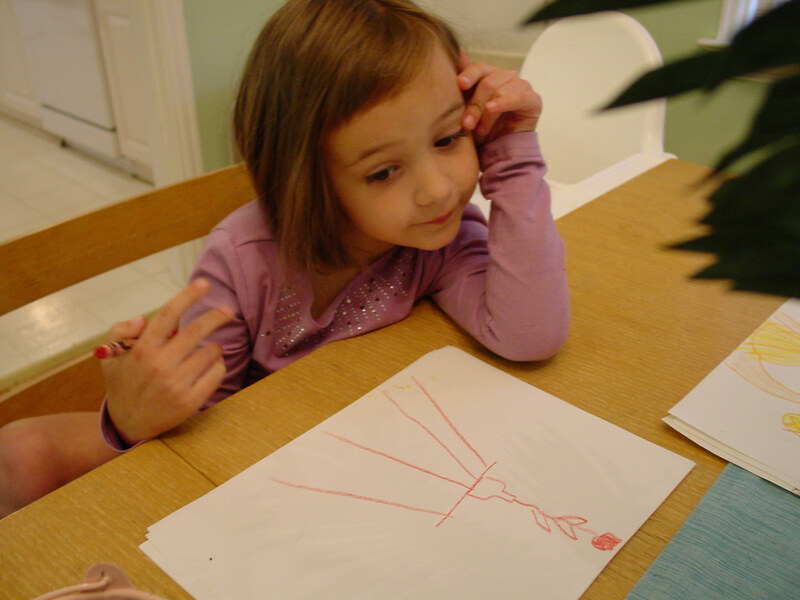 Here's a series of shots of Ava at work, deep in thought, and drawing like a fiend. 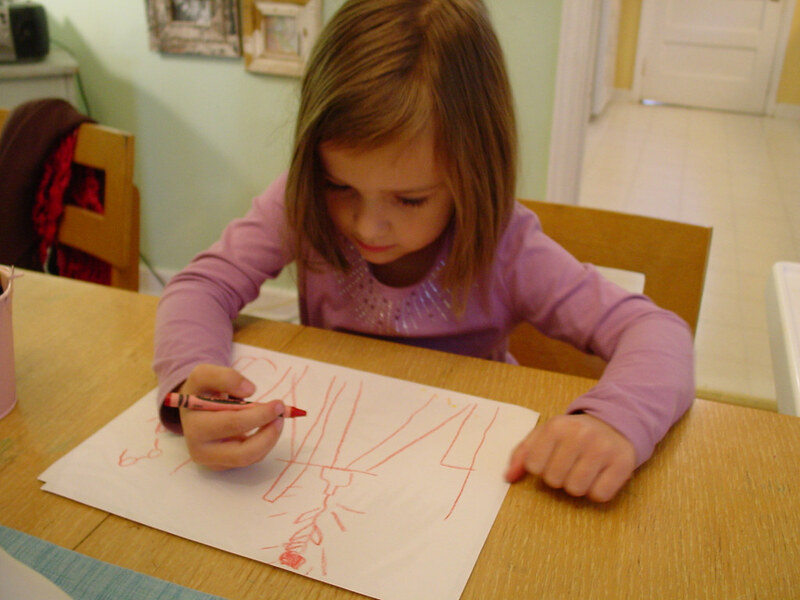 If you ever get the glorious opportunity to watch Ava draw, it's quite a sight. But of course, I'm her father, so I'm supposed to say that. Seriously, it is fascinating to watch her create something out of nothing, right before your very eyes. I'm not really sure if she has something in mind before she draws it, but I'm assuming that she does, because sometimes she draws pretty quick. No questions asked. Ava contemplating her next move. A bird's eye view of my girl at work. Ava's POV. Feel the creativity! Feel the genius flowing through you! She's now moved onto the character to the right. Almost done. Now she'll fill in the color where needed. Here it is! All done for everyone to enjoy. Funny little story here. 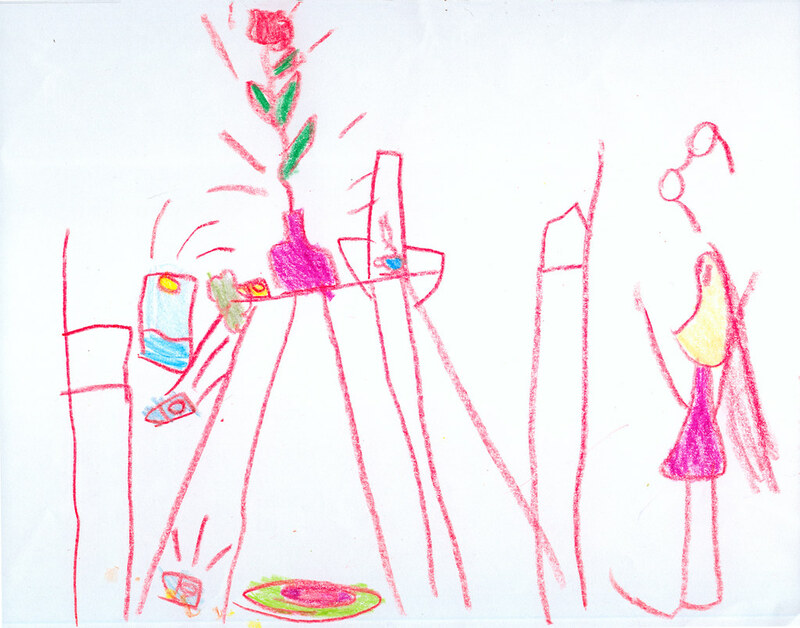 Ava tells me that this is some girl who is surprised by how the rose on the table has suddenly grown so tall, like a sunflower. She says that the girl didn't know that roses could grow like that! 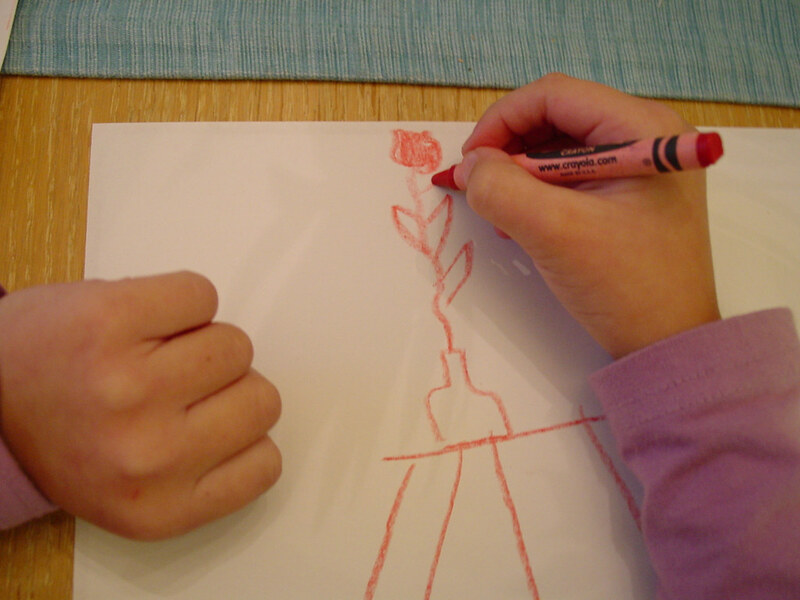 The rose has grown so fast that it knocked down a drawing and some crayons to the floor. That's a rug underneath the table. On the right of the rose on the table is a cup of hot coffee (Ava's grandmother, Meemaw, drinks coffee). I like how the girl is so surprised that her glasses have fallen off. There ya go. Thought that you all might enjoy seeing the girl in action. As I was taking these shots, Ava pretty much remained quiet the whole time -- just sat there and did her thang. No questions, no problems. Focused and with her patented "quiet determination." I try my best not to get too up in her grill when it comes to stuff like this, but sometimes a parent can't help it -- sorry, but we have to. Yes, sometimes it's overwhelming for us to do that to our kids, but I can't help but think that moments like this will be fleeting and I'll never have that moment again. So it's cameras in the faces of our kids all the way, baby. As always, you can click on the images to see their Flickr page, and then click on "All sizes" to view larger. I'm very excited about this. You can now actually download official Ward Art for your phone! START Mobile is a service offering downloadable artwork from hundreds of artists for mobile phones. It's an extension of START SOMA, a San Francisco gallery for emerging artists, both being the brainchild of John Doffing. Recognize the name? You should. He was the one responsible for the Hotel Des Arts, a boutique 51 room hotel in San Fran, featuring entire rooms painted by many of these same emerging artists. It's a pretty cool thing he's doing here with his newest venture, the START Mobile, and one that could really take off. I'm greatly honored to be a featured artist. A wonderful opportunity for all the artists involved. And, boy, talk about the artists! With the tagline Art for Everyone, Art for Everywhere, you can choose from an incredible roster of artists -- some well-known, some not (I fall into the latter catagory, I'm afraid). Check it: Shepard Fairey, Tim Biskup, Lynne Naylor, DAIM, Kirsten Ulve, fellow artist blogger Steve Mack, and many many more. You'll have to scroll down towards the bottom to find me, but that's okay. When you do, definitely download some art for yourself -- it's only $1.99 for each piece of digital goodness. Here's a shortcut to my page, but please be sure to check out all the other great artists featured. They some fine folks. So, why did I choose the images you see in my gallery? I have to tell you, it was not easy. I had to take a big long think about it, and so with my secret weapon, Andrea, helping me make the final decsions, I knew that we chose wisely. I wanted bold, strong, colorful images that pop. The kind that might make a statement about the buyer. Ones that would look über-cool/nifty/spiffy.... so when you open up your celly to make that nightly bootycall, your friends would immediately ask, "Cool! Where'd ya get that?" I hope you spendspendspend to your little heart's content! It's a great idea that has great potential. By the way, I plan to update with newer images from time to time, so be sure to check up on my page periodically. Also, if there is one image that you liked in particular that I do not have available for download, please let me know and I'll see what I can do. To Andrea, with whom I've shared the last 15 years of my life with (11 of which married): I thank the great God above for your birth into this world. More than I can depict with words, more than I can encapsulate in paint and canvas, your presence on this earth moves me to no end. And that is why I continue with what I do. Your support in anything that my multi-faceted mind conjures up is indispensible. Thank you. Occasionally I'll do some artwork for my brother-in-law, Nate (aka DJ DUST), for his hip-hop group Mars ILL. This year Nate decided to have a little fun by recording a Christmas album, so he paired up with fellow DeepSpace5'er, Listener, and thus, Just in Time for Christmas was born. To compliment the "fartin' around" attitude that the album seemed to take, Nate wanted to do something a little different from your typical yuletide cheery album cover art. 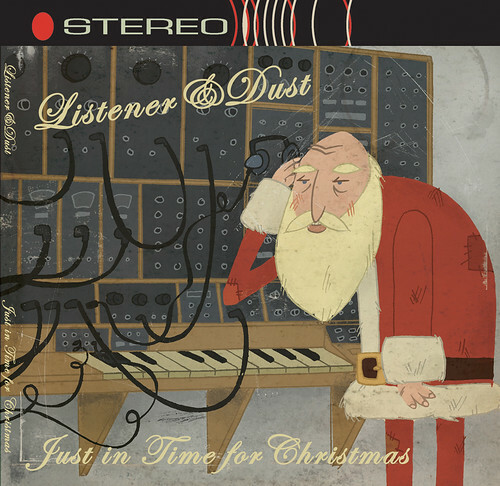 What a better way to convey this than to have your average run-down hobo-like Santa taking a little listen to some beats on some funked-out super-MOOG? Makes sense to me. To view larger, click on image to view it in Flickr. Then click "All sizes." My mom came up some time ago and handed me this little yellow piece of paper that came from a notepad. "Here, I thought you might like to put this on 'Ava Thursday.' Ava drew this while in my car when she last came to visit me." A doggie in a truck, with his tail wagging. Something so simple, yet so effective. This tells a story in one frame -- no other drawing is needed. 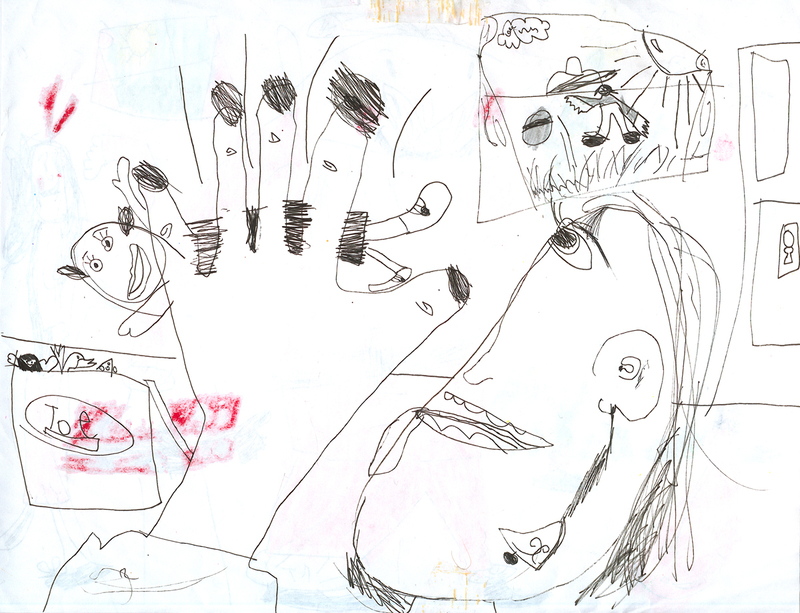 A fun little doodle by a fun little 5 year-old girl. 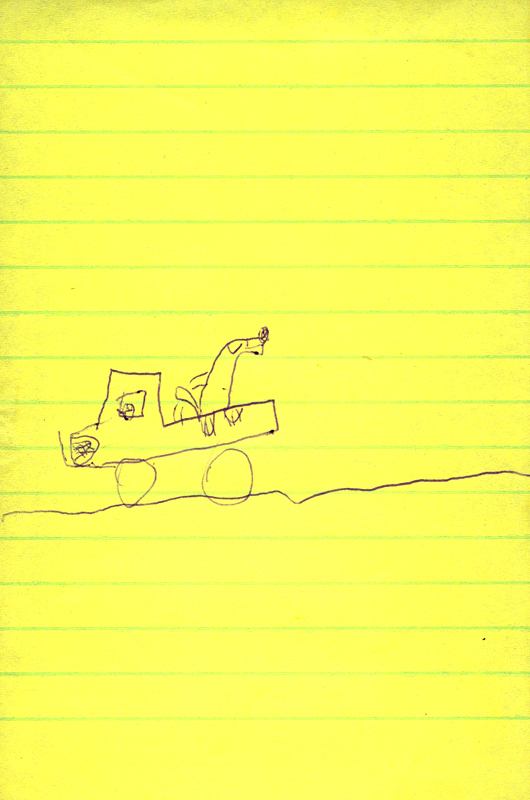 I love how she drew the motion lines for the dog's tail, showing that it's wagging, and how his paws go over the side of the truck. Classic. 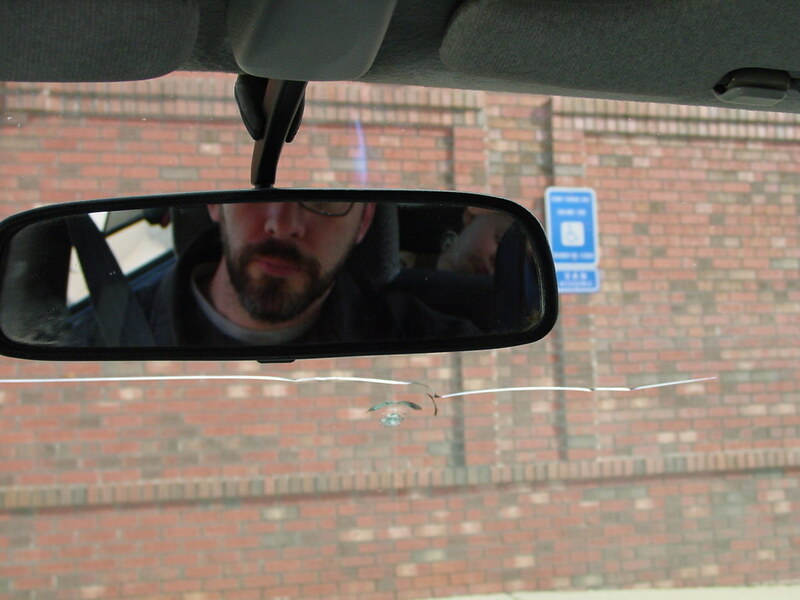 The theme for Self Portrait Tuesday this month is Reflective Surfaces. So here's a shot of me looking in the rear-view mirror while wifey goes into the one, the only Tar-zhay. That's Ezra in the back there, asleep. Poor widdle buddy. Oh, and say hello to my new beard. This is it's big debut on The Ward-O-Matic. My Flickr group, The Retro Kid has reached some milestones recently, most notably the 1000 image mark. We now are about to reach 300 members, too, which is simply amazing to me. Big thanks to all those responsible for scanning and preserving such wonderful artwork for kids from the 40's into the 60's. 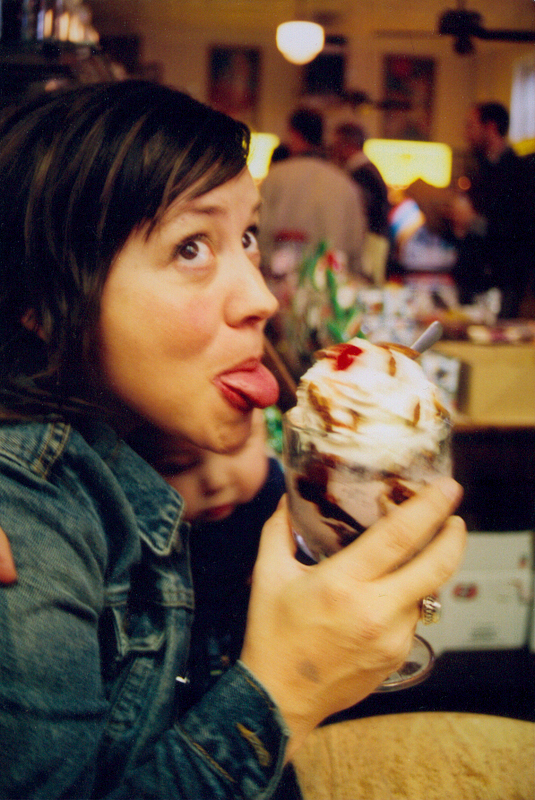 Speaking of which, my co-hort in crime over at the Kid and the one with the most Kid submissions (currently at 244! ), Eric Sturdevant has now started up his own blog, Fun All Around. 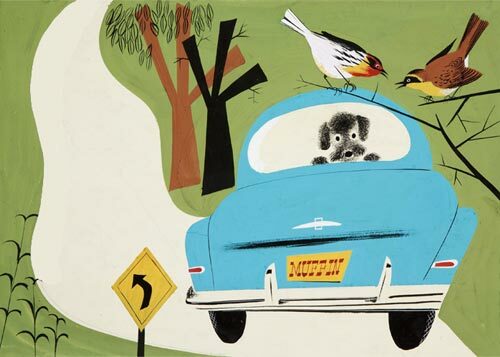 Along with some of his own work, Eric will focus on a some illustration greats from that mid-century era. Be sure to check out his post on Leonard Weisgard. Excellent work, Eric. More illustration news, previously blogged Leif Peng and his fantastic Today's Inspiration has now a blog home! With each TI post you now get more insight into the life and times of each featured illustration great -- many of which were stars in their own right back then but have been largely overlooked nowadays. It's a shame because it's so important to know your history and to give respect to your art/illustration/animation elders. Please check out Leif's Flickr, too, as he's been putting together wonderful photosets of some of these illo giants. My good pal Amid Amidi has started up Cartoon Modern, in what has to be a first: a blog for a book. 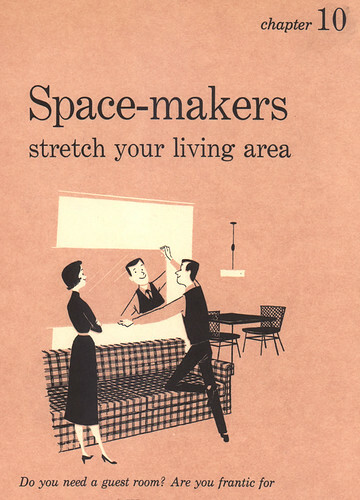 Actually, it's more like an addendum to his upcoming book on design in cartoons from the 50's. I'm such a geek for the book already, and it won't even be available until Spring of '06. It'll be worth the wait, I'm sure. Dan has started up his own blog, too! Check out a sampler of things, featuring more of Dan's incredible collection of kid's food packaging as well as his own work. He's a big Retro Kid contributor, too. Check out more stuff on his Flickr. Nick Sung did a great review of TOOT WHISTLE PLUNK & BOOM on his blog, The Firehouse Stomp -- using images of the film that I grabbed and displayed for you all back in May. This is exactly why I posted those images: for discussion and analysis, to better articulate and observe great animation design, color and composition. I highly recommend others to do the same. The more discussion, the more awareness, and the more awareness, the better we all get as artists and animators. Thanks for the post, Nick! Joel Trussell's scribbledumpster: excellent and fun characters and color from Joel, he of Cartoon Cockfight. He directed the wonderfully amazing War Photographer. Brilliant. Okay, so this post when for FAR too long than I had hoped. But there's so much great stuff out there, I couldn't stop. Enjoy these great sites and blogs, and keep it up! Ava drew this for me for my birthday last week on Thanksgiving. Yes, that's me as a turkey. 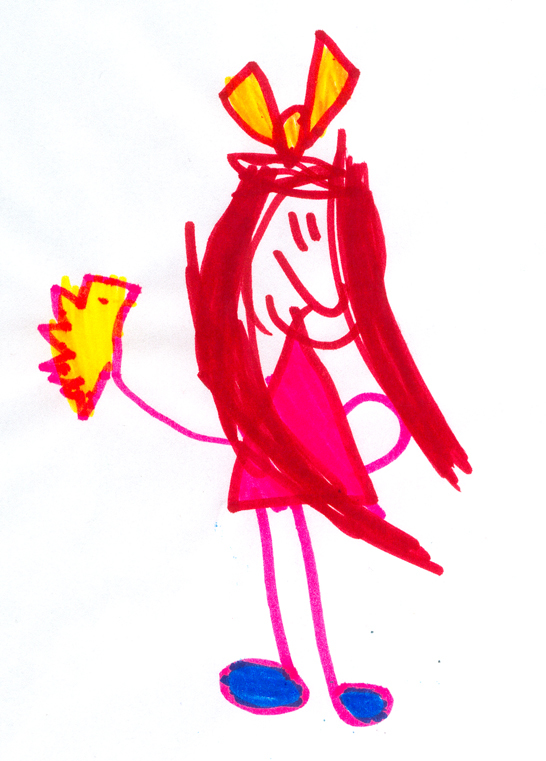 My own daughter drew me as a turkey -- funny, ain't it? It's funny, and I love it. 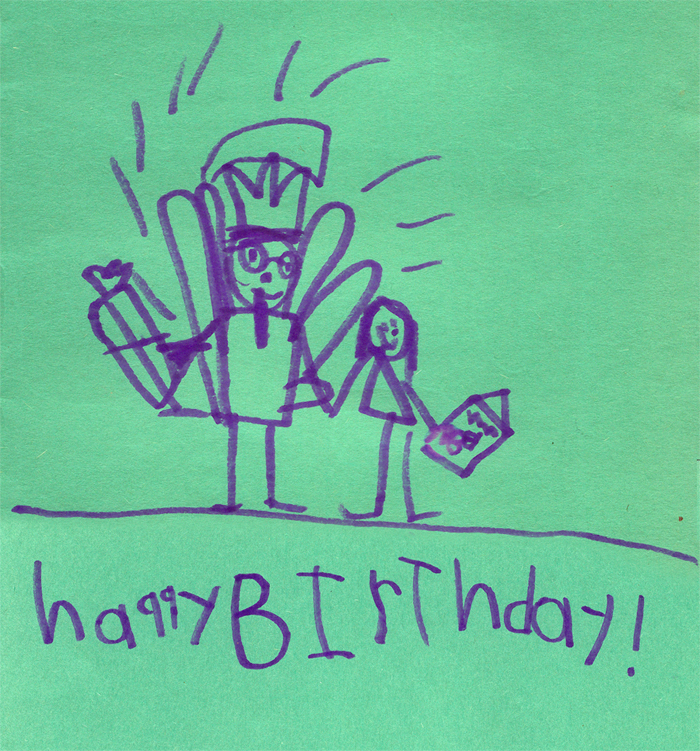 So that's me holding hands with Ava who has a birthday card for her dear ol' dad. In my other hand is a present that I'm about to open. This scene is amazingly accurate from what transpired on that day, save for me being an actual turkey. The "Happy Birthday" at the bottom there was done on another card that she drew for me, I just loved it so much I wanted to share that as well.